Gas cylinders present obvious dangers for welders, but fortunately, proper equipment — and strict adherence to OSHA guidelines — can mitigate the risks. Whether you’re working with gas cylinders for the first time or you’re simply looking to ensure full compliance in your facility, this overview should help you understand OSHA requirements for storing gas cylinders safely. The reasoning is fairly obvious: Welding gas cylinders contain highly compressed contents — pressure ratings of upwards of 2,000 pounds per square inch are common — and if a cylinder is punctured or its valve is accidentally knocked off, it essentially becomes a rocket. Keeping cylinders upright (and secured) limits the risk. OSHA regulations note that gas cylinders should be “properly secured.” Generally, that means using a strap, chain, or bar to keep gas cylinders in place. When transporting gas cylinders, they must remain secured, and should not be hoisted with magnets or choker slings, per 1926.350(a)(2). 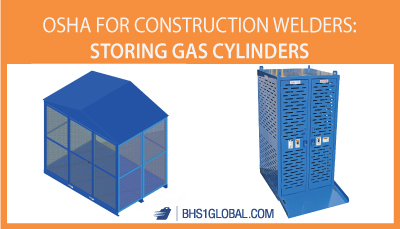 In the event of an accident, a storage enclosure (for instance, the BHS Cylinder Storehouse or Cylinder Storage Cage) can keep gas containers contained, preventing injuries. BHS storage containers are made with heavy-duty welded steel, finished with a powdered protective coating, and can be padlocked. Place cylinders where they cannot become part of an electrical circuit. OSHA regulations state that “electrodes shall not be struck against a cylinder to strike an arc,” which is another reason why a dedicated storage enclosure is incredibly important. All cylinders, lines, and equipments should be bonded and grounded, and they should be in a well-ventilated, dry, well-protected location where they can’t be damaged by falling or passing objects. Flammable gas cylinders should be placed at least 20 feet from any sources of heat, flammable liquids, or oxygen cylinders (as well as other oxidizer cylinders). When this is impractical, fire-resistant shields should be kept in place at all times. Damaged or defective cylinders cannot be used, per 1926.350(c)(3), and should be immediately removed from the work area. Gas cylinders should be in properly ventilated containers. Welding gas cylinders should only be accessed by properly trained personnel. Per OSHA requirements, all workers should undergo appropriate training before using or mixing gases in a cylinder. While OSHA doesn’t explicitly require cylinders to be in locked storage cages, a padlock can help to prevent unauthorized access. As every manager knows, workers tend to use equipment as makeshift tables; needless to say, stacking items on top of gas cylinders creates a totally unnecessary risk. Cylinders shouldn’t be used as rollers or supports, regardless of whether they’re full or empty. Cylinders should be properly labeled, and empty cylinders should be labeled differently than full cylinders. Cylinder valves should be closed while the gases are being transported, and workers should take proper precautions to keep cylinders secured during transport (except when hoisting a single cylinder a short distance). The BHS Cylinder Transporter and Cylinder Transport Cage can make this process much simpler. Please note that this blog isn’t intended as a complete set of guidelines for maintaining OSHA compliance when using gas cylinders; OSHA’s full guidelines can be found here, and if you operate a facility that uses cylinders, you should review each regulation carefully. With that said, proper gas cylinder storage equipment — combined with some common-sense management policies — should keep most facilities fully compliant. “29 CFR 1926.350 – Gas welding and cutting.” OSHA. Occupational Safety and Health Administration, U.S. Department of Labor, n.d. Web. 20 Dec. 2018. “Compressed Gas Cylinders.” UIOWA. The University of Iowa, Environmental Health & Safety, n.d. Web. 20 Dec. 2018.